Walking clears my head. Especially here, on the eastern lip of the Atlantic, the fresh winds gusting in over Galway Bay clear the cobwebs of editing and writing from my mind. When I need a break from work – from books, paragraphs, sentences, words, letters – I walk. It’s been a weird year, weather-wise. All the seasons have gone weird. Ireland had a summer so dry and baked that the grass died and the trees, stressed, began shedding their coats. Then autumn turned stormy and ransacked them, the usual crackle of sloughed-off leaves underfoot replaced by a sodden mush. Now that things are vaguely normal again for the time of year, it’s a relief to see some autumn colour survive, and gradually fade as it falls earthward. So I was looking around as I walked, taking in the changes, when I noticed the graffito at my feet. I can’t decide if the Q needs the leaves more than the leaves need the Q. Aesthetically, I mean. In another context, with more letters, it would be an unexceptional Q, an unadorned stencil in white on rough slate grey. Here, by itself on the footpath, it’s a veritable mystery. This entry was posted on Saturday, November 3rd, 2018 at 10:33 am and is filed under Ireland, nature, personal, photography. You can follow any responses to this entry through the RSS 2.0 feed. You can leave a response, or trackback from your own site. This world needs more non-threatening mysteries. Love your leaves and Q. Thank you, Char. I love small mysteries too: they get the imagination going. Bizarre, but in a comfortingly small way. It feels right. The world is as it should be. 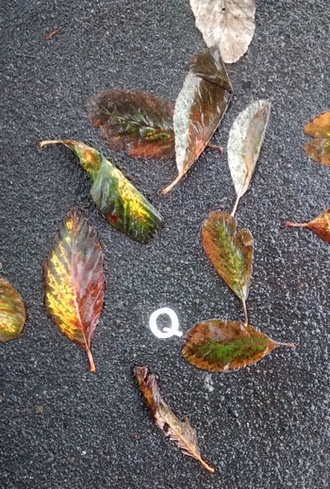 Leaves and a Q. Just right. Yes, exactly. Random Q on the ground? Why not. I just saw a random 8 on Twin Peaks! Another nice symbol! Did you take a photo, by any chance?